WELCOME TO PRIME LIFE MINISTRIES: Jesus Is Crucified, Mummified And Resurrected. Jesus Is Crucified, Mummified And Resurrected. After His crucifixion and death on the cross, Jesus was taken down and His bruised and bloody body cleaned as much as possible. Then, Joseph of Arimathaea and Nicodemus placed Jesus in the borrowed tomb. They wrapped His feet, legs, arms and torso with two inch strips of cloth. (everything but His head). They used 100 pounds of myrrh and aloes (a liquid oil) to saturate every inch of the cloth strips. When this liquid dried, it formed a very hard shell in the perfect shape of Jesus' body (See John 19:39). 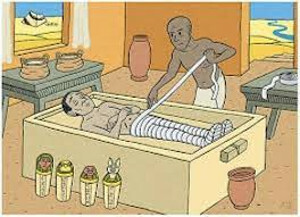 Note: The Israelis learned this mummification process from the Egyptians during their 400 plus years of captivity in Egypt. In accordance with Jewish burial customs, they laid a burial cloth over Jesus' head. When they had finished, they had a very large round stone rolled over the entrance of the tomb to seal it. Jesus lay in the borrowed tomb for three days and three nights. Sometime after sunset on Saturday and before sunrise on Sunday, the Holy Spirit raised Jesus from the dead. Very early on Sunday morning, just after sunrise, Mary Magdalene, Mary the mother of James, and Salome went to the tomb so that they might anoint Jesus’ body. When they got there, they saw an opened tomb and an angel who told them that Jesus was no longer there and had risen. Next, they saw the risen Jesus who told them to go and tell His disciples to meet Him in Galilee. As soon as they heard that Jesus had risen, Peter and John ran to the tomb. When they got there and went into the tomb, they saw the untouched hardened Myrrh and Aloe covered shell that was empty and the neatly folded head cloth laid on the bench. For the first time, they understood that Jesus had actually risen from the dead just as He told them He would. For all the details, read Mathew 28, Mark 16, Luke 24 and John 20. The resurrection of Jesus Christ was the beginning of Christianity. If Christ had not been resurrected, Christianity would not exist today and we would have “No Hope” of having our sins forgiven, of being saved, or of spending eternity in Heaven. Hallelujah – Jesus Is Alive And Well And We Can Be Saved If We Choose To! For you to spend eternity in Heaven, you must choose to accept Jesus as your savior and make Him Lord of your life. There is no other way! If you have not done this yet but would like to, say the following prayer. Believe it with all of your heart and mean it from your soul. If you do this, you will be saved (born again) and Heaven will be your eternal home. Dear God in Heaven – I come to you in the name of Jesus. I ask that you forgive me of all my sins. Cleanse me with your precious blood from all unrighteousness. With my mouth, I confess the Lord Jesus. In my heart, I believe that you raised Him from the dead and He is alive. This very moment, I accept Jesus Christ as the savior of my soul and I make Him Lord of my Life. And according to your Word, which cannot lie, I’m washed, I’m cleansed, I’m forgiven, I’m saved. Praise God – Hallelujah – Amen! Important: To confirm your salvation, tell someone what you have just done. If you have already accepted God's Free Gift of Salvation but are not telling others about it, please click on and read our "Tell Others Page". Then, begin regularly using this free tool to witness to all your family members, friends and others you know who are unsaved. God loves them all and doesn’t want any of them to go to Hell. But, He is relying on you and us to be His spokespersons.